Taste of Home Cookbooks $5.00 Each! Here’s a hot deal on cookbooks! 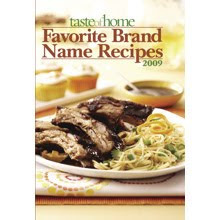 Taste of Home has LOTS of titles on clearance for only $5.00 each!! These offers are good while supplies last or until March 5th – which ever comes first! Head on over here while the selections are still good! You can also get free shipping with the code 347 at check out when you spend $10.00 or more. (Thanks to a reader for passing this along to me courtesy of Hip To Save). If you want to get paid to shop, you can go through one of these sites: Shop at Home -10% + $5.00 first purchase bonus; Ebates – 5% + $5.00 first purchase bonus or Mr. Rebates – 7% + $5.00 sign up bonus.